Even for people who have been in Cape May for generations, the Cape May of just 50 years ago is a real juxtaposition with today’s town. Cape May Point rejoices in being quirky, quaint – but authentic– and off the beaten path. 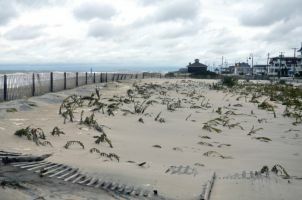 City Manager Bruce MacLeod attributed Cape May’s good fortune to two things – the eye of the storm passing just north of us 2.5 hours in advance of high tide and wind shifts which kept tidal surges at bay. The historic storm slammed into our seaside town. See our “Aftermath of Sandy” photo gallery. Not many marriages are perfect, but one exception might be for the one between creativity and practicality. Among the offspring of this union, one of the most beloved is the American quilt. WWII Army Veteran and local personality Joe Crews died Memorial Day at the age of 91. Funeral services were held Monday, June 4. If the vision of one of East Cape May’s founders had caught on, homes on Beach Avenue east of Madison might have looked more Spanish Mission style today than Victorian. Pirate treasure in Cape May County? According to an old undated newspaper filed away at the Cape May County Museum, an author identified only as Z.H. recalls a story told to him about Captain Kidd’s treasure supposedly buried in Cape May County. It has been Cape May legend that Abraham Lincoln and his wife spent time here. There is no factual documentation that they enjoyed summer here as other presidents did, some visiting more than once.